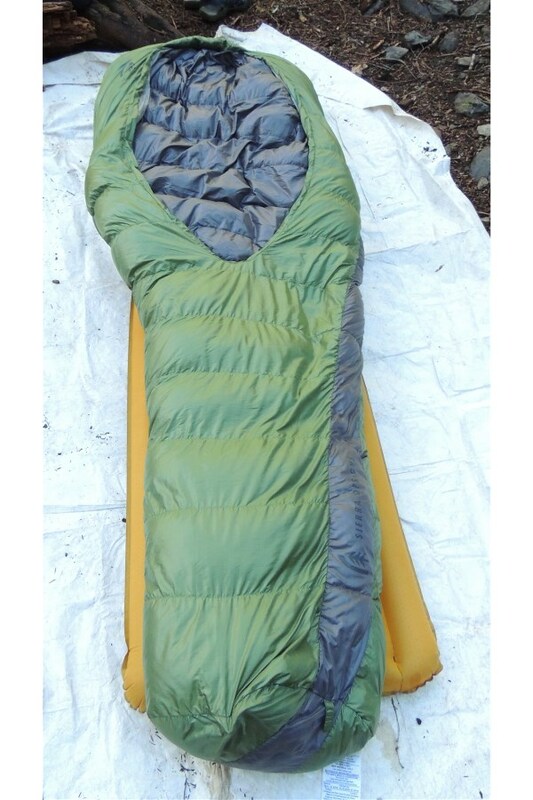 At first glance, the Sierra Designs Backcountry Bed looks way different than any other typical sleeping bag. The most obvious and notably difference about this bag is the large opening and comforter. It looks like a down blanket which you pull up over the torso as needed for warmth or left down in warm temperatures. This allows the user to easily and quickly adjust the amount of covers you need without fumbling with zippers as on typical bags. The next thing I noted was the very large space at the head and torso of the “bed.” In the field, this turned out to be one of those things you always wished for, but never had in a traditional bag. In this bed, you can truly stretch out, and it allows you to place your pillow inside the bag so it doesn’t slip away from you during the night. I typically use an inflatable pillow along with a small fabric one on top of it for comfort and separation from the inflatable one. With the Backcountry Bed, both stayed in place inside the hood of the Bed under my head and didn’t move even as I moved throughout the night. The very large oversized torso portion of the Bed is so big it allows you to sleep comfortably on your back or tummy with your arms on both sides of you. Most Mummy style bags feel cramped in these positions. The overall feel is truly more like a bed than a bag. The Bed also has an opening at the foot box which allows you to put your feet out the opening if weather is too warm to comfortably keep them in. Some people who typically feel cramped in tight foot box bags may feel less restricted if they push them out through the opening. The bag I tested was a 20 degree, 3 season, 800 Fill Dridown unit, but the manufacturer also has lighter options for those seeking a more ultra-light bag. I’m from the Pacific Northwest, and our climate is often rainy and has high humidity. 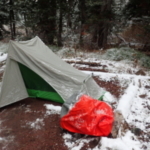 We all know how down can lose a lot of its loft, and therefore insulating ability, if it becomes wet either from rain or dampness condensing on the walls of a tent. This product is made with DriDown insulation. This is a treated duck down, which both resists getting wet and dries faster if it does. On the underside of the Bed there is a sleeve that allows you to insert your sleeping pad inside of it. It was a tight fit for my pad, but I did manage to get it tucked in. Sometimes during the night we all feel ourselves slipping off the pad, especially if we aren’t on flat smooth ground. 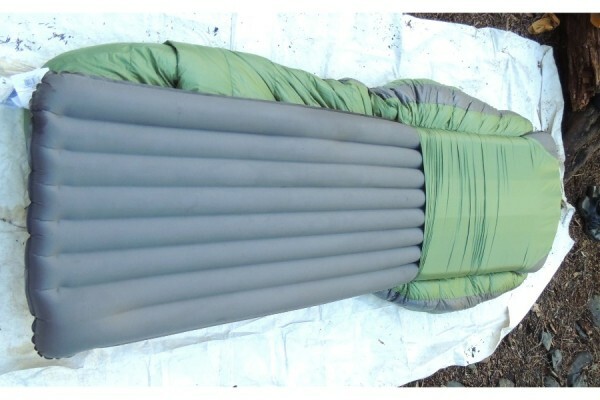 This sleeve keeps the Bed and pad directly under you even on a cross slope. 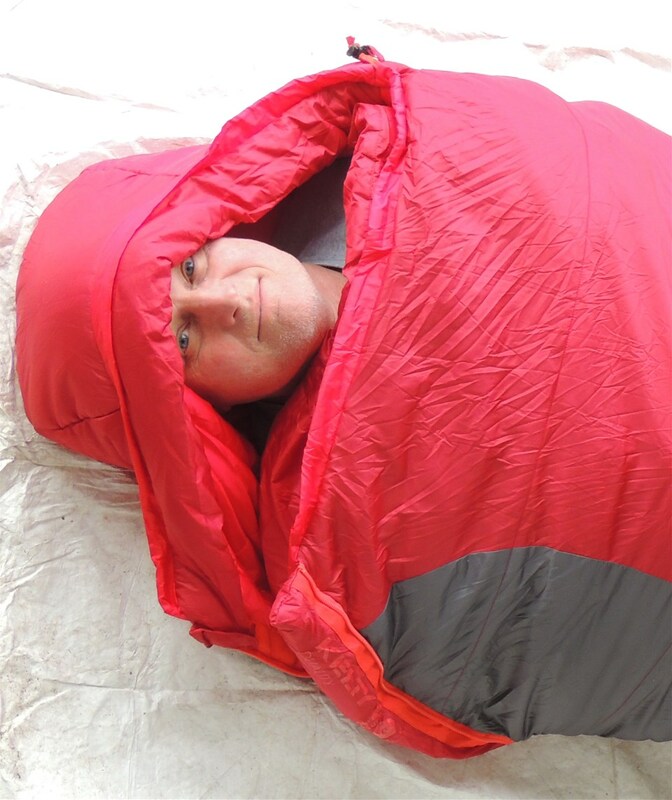 No doubt this will help retain heat on cold damp nights as you won’t wake to find yourself laying half on and half off of your sleeping pad. On my first outing with this sleeping bag, I found it was quite comfortable. I like how easy it is to get into and out of as opposed to slithering into a regular mummy bag. 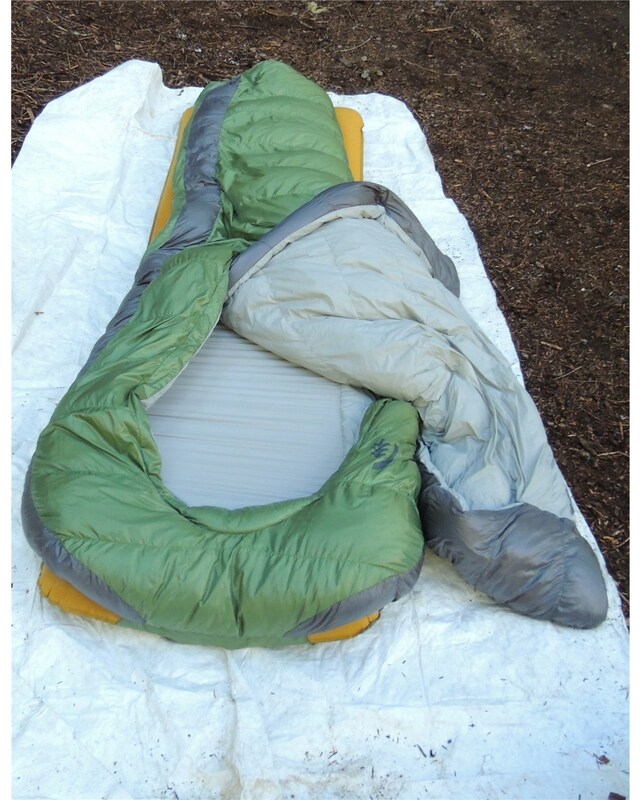 This is especially true if you need to get up in the middle of the night and don’t want to disturb those camped close to you… less sleeping pad rustling noises or grunts and groans struggling in and out of the bag. 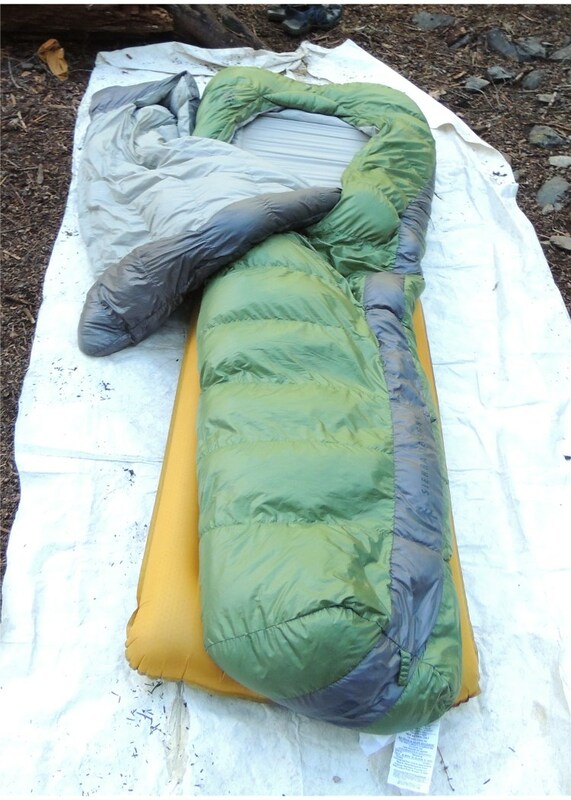 It got down to about 40 degrees that night, and I was quite comfortable and even didn’t fully cover myself with the comforter portion of the bag. It’s nice and easy to adjust from a warm evening to a cool night with the comforter, because you can just throw it off or pull it up as the temp changes. The comforter even has hand pockets to assist in pulling it up over you and to provide extra warmth for the hands in colder weather. In cold weather, closer to freezing, my head was a bit chilled inside the hood. It didn’t seem to wrap around and enclose the head very well, which may have something to do with the pillows inside the Bed. I did pull up the comforter and tuck it around my head as much as I could, but still felt some drafts. I plan on taking a balaclava along to better insulate my head on future outings with this Bed for those chilly nights early and late in the season. My plan is to bring along an ultra-lite down sheet or down sweater to use when the colder weather sets in and use this bag most of the year. If you like lots of room in a bag, this works very well. It definitely will perform well in Summer, early Fall and late Spring just as it comes from the store. I will likely use this as my regular bag because it is so comfortable and versatile. You can stick your feet out of the bottom and leave the torso uncovered, or even sleep on top of it if it is really hot. In some ways, it’s like a down sheet style bag. 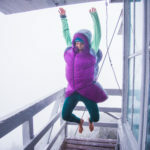 This is definitely a 3 season bag, which can be a little cold in those coolest evenings in shoulder seasons, but – with a little extra gear – it performs well down below freezing. I like the roominess at the hood so that I can put my pillows inside the bag. Its weight is well within reason for such a large bag. It stuffs down to an easily manageable size that fits inside your pack. Damp weather doesn’t inhibit its usability with the DriDown technology. Even when it got a little water on it, it shed the moisture off and, when I got it really damp, it did dry quickly and lost very little loft. 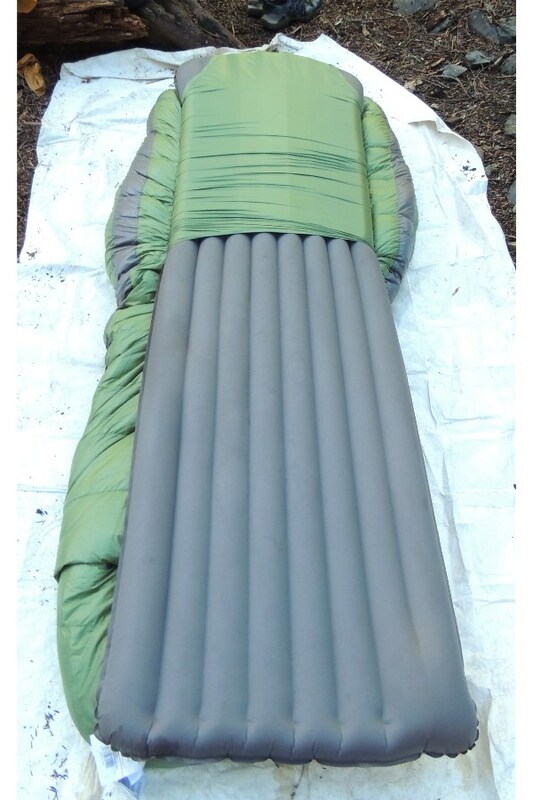 I would definitely recommend the Sierra Designs Backcountry Bed sleeping bag for any backpacker looking for a versatile bag that really ups the ante in terms of comfort.